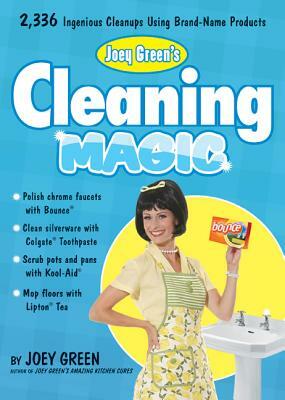 The public is endlessly fascinated by quirky and offbeat uses for their favorite products and, this time around, Joey Green tackles household chores with his pantry full of cleaning power. Green's easy and effortless tips and tricks show how to scrub, deodorize, shine, and remove stains with products already in the house. While Green's suggestions may sound implausible, they are, in fact, highly effective. Most products on the market today are a complex mix of lubricants, abrasives, and cleansers, giving these brand-name products plenty of power to clean, dissolve, and fix in the most unexpected ways. Joey Green's Cleaning Magic offers clever ways to make household items do double duty, like using a slice of Wonder Bread to clean up tiny shards of glass from a kitchen floor—just pat it flat against the floor and toss it away—and wiping away the gunk from the bottom of an iron with Purell. This practical, useful, funny, and entertaining volume includes thousands of incredibly simple ways to clean up every room (and dusty corner) in the house. JOEY GREEN has authored more than 30 books and frequently appears on national television. He lives in Los Angeles.